The holidays are coming. Run for your life. We all know the holidays are both loved and hated for the endless buffet of sweet treatsÂ they bring. Pies, cakes, cookies and candy are in endless supply and ready for your consumption. But, like the next person, I'd like to enjoy a bit of holiday flavor and not have to sacrifice the next year of my life forÂ a slice of deliciousness. Take pumpkin pie for example. It's a holiday tradition! The color, smell and flavor are almost irresisitible. But hold the phone, that pumpkin pie (whose name sounds healthy and whose formÂ looks healthy) Â is full of unnecessary roughness, i.e. sugar, oil and fat. If you don't want to sacrifice your waistline to the holiday sugarÂ GodsÂ then add this easy recipe for Sugar-Free Pumpkin Pie to your line-up. And this is how you do it. TIP: Spices areÂ your friend all the time and especially during the holidays!Â So,Â for extra flavor pump up the spice. You can add ginger, allspice, or nutmeg to satisfy those tastebuds while watchinngÂ your waistline. Preheat oven to 425 degrees, then combine all of the ingredients in a large mixing bowl, pour mixture into frozen crust, bake for 15 minutes at 425 degrees, then reduce heat to 350 degrees and bake for 45 minutes. Let cool and garnish with whipped cream and nutmeg. Â * Stevia is a natural sweetener extracted from the leaves of the Stevia plant. CultivationÂ of theÂ Stevia plant has been the norm for years in Central and South America and is aÂ natural alternative to chemically alteredÂ sweeteners found on theÂ market today. Â Ewww! Be kind to your body. 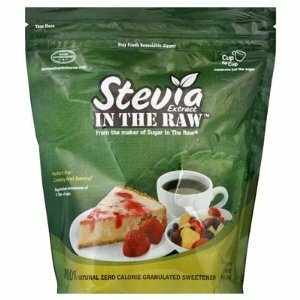 Another cool thing about Stevia is that it can be used as a 1:1 substitute for sugar in baking.